Adventures at Convention: Flying out! It's a lovely Sunday morning and it's time to bid everyone adieu, as I fly out to beautiful Denver, CO for the big Stampin' Up! Convention. I'm attending the Second session, and am very jazzed (otherwise known as "frightened-to-bits") to be presenting on recruiting during the afternoon classes. I'm sure it will all be a wonderful experience and I can't wait to share about it. There are lots of peeps I'm excited to see again so I'm sure my face will be sore from smiling and laughing, and arms tired from all the hugging. What a rough, rough life I lead! In super happy news this morning (found out at 2am), I learned that my oh-so-talented downline Marika LeMay from Crabtree, QC won the #3 Rising Star award for Canada!!!! WOOOWWWWWOOOOOOOH! I am so stinking thrilled for her... not only did she earn her first cruise in her first full year with SU, but she'll be flown to Arizona & glorious Powell Lake for a Founder's Circle retreat in September. Je suis tellement fiere d'etre une de tes marraines, Marika -- felicitations!!! I'll be arriving this afternoon and meeting up with Nancy Gauthier & Maryse Morneau, my fellow demonstrators from Quebec who will also be my roomies for the week. My downline Dina is also going to Denver but she's staying at a different hotel and is on a different "track" then us, since I'm on the French one. That's okay -- I'm sure there will be plenty of opportunities to find each other there! 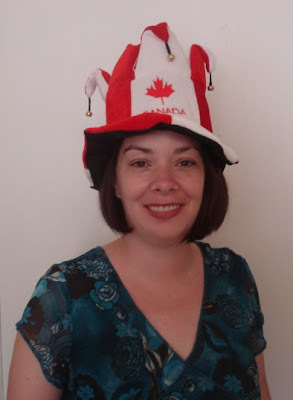 Besides, I bought her a matching Canadian Jester hat -- won't we be stylin'??! Who says Canadians can't have fun?! Anyhow, my hotel and the Convention centre both have business centres with computers & Internet access, so I expect to be posting often. If you're attending Second session, come and find me - please! WOOHOO! It's that time again...time for an awesome sale! Have you seen the new "Three For You" Punch box in the new Fall-Winter 2007 Collection? I have it, I love it, I've been using it like crazy and now you'll want to have it as well. When you purchase this great new punch box in August, Stampin’ Up! will also include an exclusive assortment of textured Love Notes for FREE (value of $17.95 CDN) *plus*...I'll even throw in some matching ribbons to sweeten the deal. - 30 pre-scored textured 3″ x 3″ cards: 10 each of Wild Wasabi, Purely Pomegranate and So Saffron. You can order this from me up until August 31 (Canadian orders only, please), so just call or email me, and I'll get you all set up. Want to save an extra $5.00 off the purchase of your "Three For You" Punch Box? Just book a workshop or RSVP for a fee-based class in August, and you'll save even more. 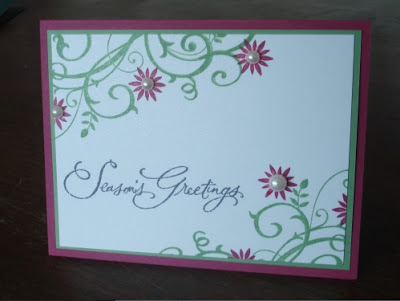 FESTIVE FAVORITES & SNOW FLURRIES: This one's a CASE of notimetostamp's lovely Pretty In Pink/Chocolate Chip card. I used the Cutter kit to distress the edges and added some hemp to give a litle bit of a rustic flair to counter-act the pretty-pretty feel of the pink. LOVELY AS A TREE: I used a custom Spectrum Pad that I made a few years back, using Rose Red, Gable Green, Green Galore and...hmmmm... I can't quite recall right now. But I love the festive colours and so I fiddled with the design a bit and came up with this one on glossy white cardstock. 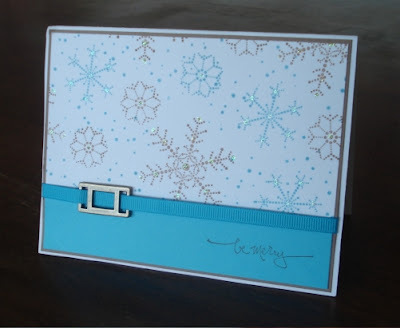 THE SNOWFLAKE SPOT: This square card was inspired by the card I got from Karen Drummond last year :) only I enlarged the design it so that it would fit our medium square envelopes and added the scallop punch & clear rhinestone. Colour scheme is : Sahara Sand, Old Olive, Elegant Eggplant and Purely Pomegranate. 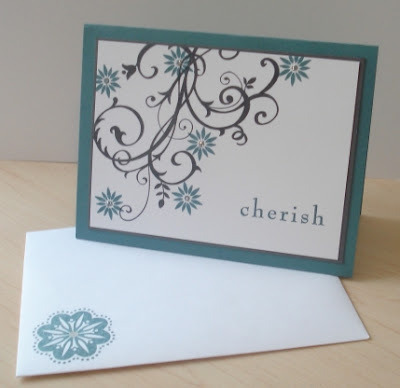 WINTERGREEN: This card uses practically NO stamping, just for the sentiment on the front! I *love* this new paper package and have been fiddling with it non-stop. Plus a button for good luck! 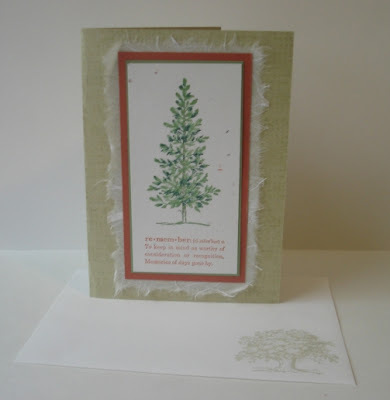 SOLEMN STILLNESS: For this card, I use the craft ink for both embossing with Hologram Highlights (the tree), Iridescent Ice (the ground) and for sponging in the sky. I love the monochromatic look of the Night of Navy and white, and how much it sparkles in real life. Please visit my Classes page for details on attending this class or purchasing it "To Go". This is the final stamping class for July, but don't forget about Friday night's Demo Information Night. If you have any questions about becoming a Stampin' Up! demonstrator and learning about my awesome August Starter Kit special, come on by! What's coming later this week on the blog? As I finalize my preparations to leave Sunday morning for Convention in Denver, I won't have much of my own work to show you. 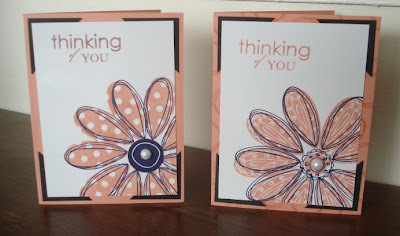 So instead...I'll be featuring the stampin' stylings of Denise Russell - be watching for it! Remaining 7 cards from Saturday's 10 card camp! SIMPLY SAID: Rose Red & Basic Gray with Naturals White (love the taffeta ribbon!). CASE'd from Mommy2Justin's card on SCS. SO SWIRLY JUMBO WHEEL: *Love* this new wheel! 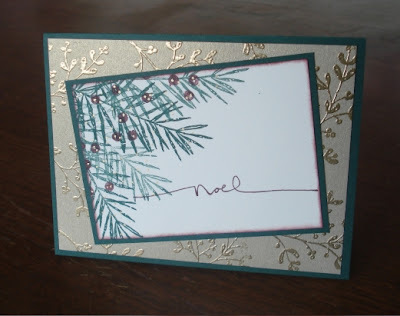 Uses Blue Bayou and White Craft ink... little bit of bling, of course. SASSY STEMS: New colours - Purely Pomegranate, Groovy Guava, Soft Sky and Wild Wasabi. Patterned paper is from the "Darling Doodles" kit and there's glitter on the flowers. Oh yes... and double-stitched grograin ribbon, too. LOVELY AS A TREE: River Rock and Wild Wasabi paired with some Really Rust and mulberry paper. LOVING this new "Define Your Life" set.. there are some fab definitions in there and I think it will be worth every penny. 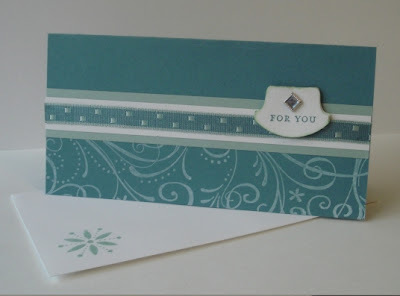 IN THE SPOTLIGHT: Had fun choosing a set that my new 5-petal flower punch would work with, and this one did! Can't really see the VersaMarked background unfortunately (Real Red & Night of Navy colour scheme). 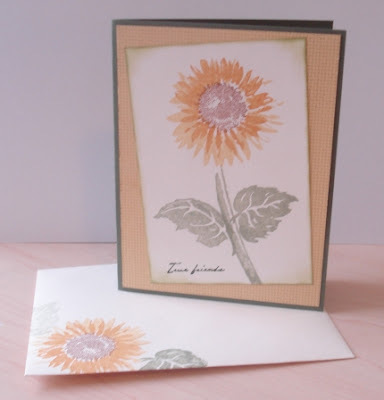 FLOWERS & FLOURISH: Totally CASE'd the design from juls716 card, just switched to the new "Creepy Crawly" paper instead. 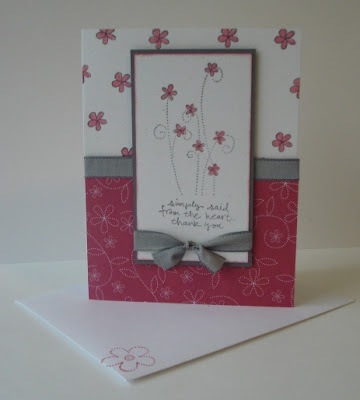 I also used the new 3 flower punch from the new kit to punch out a small flower from the scrap patterned paper! You can still order this class "TO-GO" with all the pieces/envelopes pre-stamped (or left blank on reverse for you to stamp your own images if you prefer) and ready for you to assemble.. Contact me to order yours now! By all rights, after the evening I had I should be in bed right now still asleep. Instead, it's 7:07am and I'm preparing for a full day of stamping classes...but not before sharing a bit about last night's festivities. 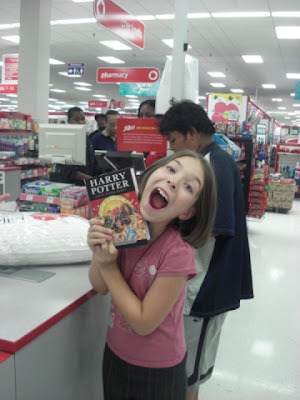 My 9yo daughter Serena is a huge HarryPotterManiac. 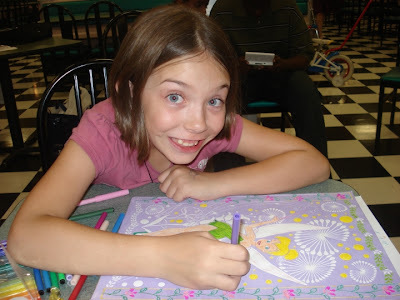 She watches YouTube fan videos, clips of Daniel Radcliff and the other young actors, puts on Hogwarts puppet shows for us and is just "their biggest fan". So naturally we'd be doing something last night for the big release! Thing is, everything is at 12:01am and Serena is NOT a night owl...and neither is her mommy. So we opted to not go downtown to one of the big Chapters or Indigo events and instead walk to Zellers (1.5 blocks away) to participate there. They had the first Harry Potter movie on for us in the restaurant where we had free drinks & popcorn all night long. We spent our time enjoying the film and colouring in doodles. By 11pm Serena was just knackered, to the point where I went and bought her a pillow so she could flake out on the bench. She was determined to stick it out! The last hour REALLY dragged out until the last 15 minutes or so, where all of a sudden people were arriving at the store in masses, coming to get their books. We got little white stickers to prove we were first and then finally at 12:01, after MONTHS of waiting, they started handing us the books out there at the restaurant! We *RAN* through the store to get to the cashier first... ran like total lunatics lauging and howling the whole way. SHE WAS FIRST! We paid ($19.95 CDN after trading in some points), they handed us a $10 gift card, and we were out of there in a flash. We ran out the store and starting flashing our book at people pulling in to the parking lot, again cackling like 2 madwomen. Same thing to the garbagemen working our street (hee hee). We were home and in the door literally at 12:10, in bed by 12:15, and curled up together to read. She lasted maybe 10 minutes and I made it another 15 perhaps, but then I gave up the good fight. I mean, you all actually want me AWAKE here today, right???? LOL! HAPPY STAMPING & POTTERING THIS WEEKEND! 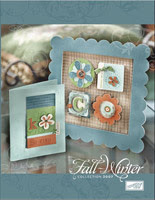 Would you like a copy of the new Holiday Mini catalogue? If you're in Canada and would like a copy of the new Holiday Mini catalogue mailed to you, please EMAIL ME with your name & mailing address and I will add you to my distribution list. The mini itself will take effect September 1 and should arrive in your mailboxes by the end of August. Let me tell you now.... it's GORGEOUS! There are some delicious new papers ("Apple Cider") & accessories (mini library clips!!) and of course, great stamps. There are fall, Halloween & Winter Holiday stamps galore, and believe me, I'm going to have some serious problems staying within my budget this year. So drop me a line if you are interested, or just pick up your own copy in late-August here at the studio next time you're here for a class or club night. 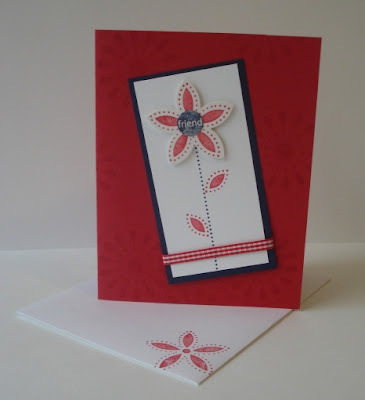 You can't really see the silver glitter in the centre of the 3rd card's flowers, but it's very simple and elegant. If you hate glitter, you can always use the Zig Painty's silver end, like I did on the envelope's flourish. If I have time later today, I'll post the rest of the cards (and add the supplies lists) we will be making during Saturday's 10 card camp. If you'd like more information about this and other classes or if you would like to RSVP (still room!) and also how find out how you can get the classes "TO GO", please visit my Classes & Events page. 3rd Stampers Club card and Scavenger Hunt winner! 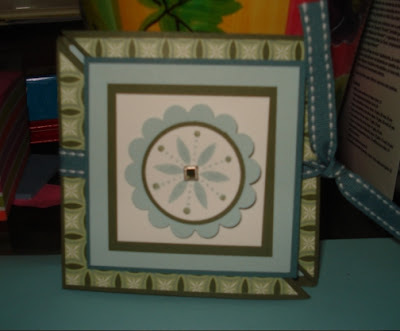 Here is the 3rd project that we've been making for July's Stampers Club (the other 2 projects can be seen HERE). This is made using the new Pick A Petal set (for the flowers) and Flowers & Flourish (for the sentiment) stamped in Basic Black and Groovy Guava on glossy white cardstock; I CASE'd it from askloentrup's pretty card on SCS. As an embellishment, we used the half-back pearls from the Pretties kit to add a fun 3-D element to the centre of the flowers, 'cuz I can't stop playing with this darn kit! There is still room available at tonight's Club gathering so feel free to RSVP if you would like to join us. The other important piece of news you've been waiting for is the winner of my recent New Catalogue Scavenger Hunt. I asked 15 questions (see the answers here) and funnily enough, happened to get exactly 15 entrants! After throwing everyone's name in a bag, I pulled out ANN MURRAY of Toronto to be the grand prize winner! She won "In Any Event" and "Love It", both of which were level 2 Hostess sets from the 2006/7 catalogue. Congrats, Ann! As a consolation prize, ALL PARTICIPANTS WILL RECEIVE A SAMPLER PACK OF THE NEW “IN COLOR”S, half a sheet of each! Please email me your mailing address so I can send your prize to you, or arrange to pick it up the next time you're at my studio. Just a bit of time left to enter the Scavenger Contest! The deadline to get those Catalogue Scavenger Hunt answers in to me is TONIGHT July 13th at midnight. If you are NOT subscribed yet -- it's not too late. Just sign up (on the left) and I'll send you the hunt information! What's the fabulous-o prize I'm giving away? Want a hint? huh huh, do ya??? 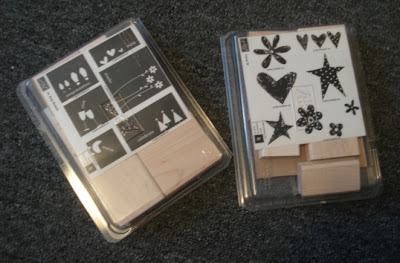 2 of our July Projects - come stamp with me! There hasn't been much time to stamp with my youngest home with a fever, but I wanted to share two of the 3 July projects we'll be making tonight and on Tuesday night for this month's Stampers Club. 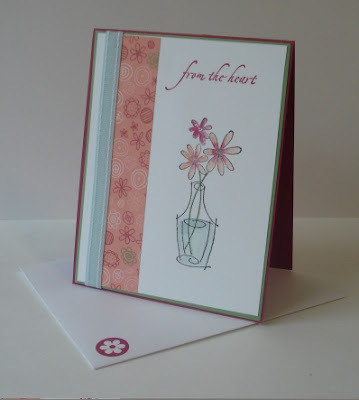 The first is a trifold triangle card using new papers, colours, sets, accessories and ribbons. I have received a few of these before in swaps and loved them, but I never knew how fun and easy they are to make! 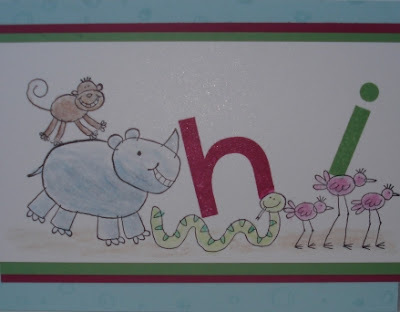 Our second card was a variation on a card made by Felie68, using the new "Zoofari" set plus the "Big Deal" alphabet. I loved her little animal parade and couldn't wait to try it myself. I used black Stazon on the white Shimmer paper to bring that exta subtle dazzle to the card and oh, what the heck, I might go back and glitter the letters later if I need to jazz it up even more. Did you know that you are welcome to come and make this month's projects even if you are NOT a current member of my Stamper's Club? Absolutely! Visit my classes page for more information on times, etc and to RSVP your spot. Hope to see you soon! p.s. The free S&H special has been extended to July 15... so don't delay! Please email me for details (Canadian orders only please). 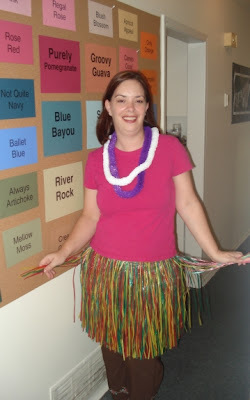 "Christmas in July" and a touch of Hawaii! Okay, my camera is acting up a bit and therefore the pictures are pretty dark (sorry about that) but here are 4 of the 5 cards we'll be doing tonight for the 1st of this summer's Christmas Card camps! I still have spots available, so for more information please visit my Classes page and RSVP if you want to come. 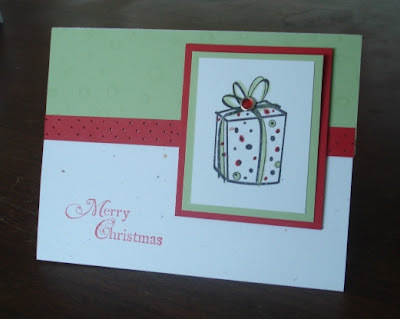 If you can't make this class, then the next "Xmas in July" card camp will be on Wednesday July 25 where we'll make 5 completely different cards. Card #1 was CASE'd from Helayne's holiday card to me last year and uses "The Snowflake Spot" & "Warm Words" in Close to Cocoa and Tempting Turquoise, with some glitter and hardware added. Card #2 was based on Sherri Barron's card using the new "Year After Year" set, the "See You Around" jumbo wheel, so paper piercing and a rhinestone brad. 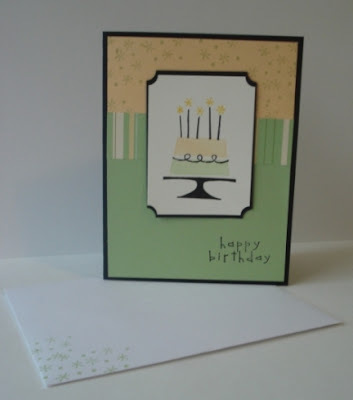 Card #3 uses my favourite "Peaceful Wishes" and was based on Brenda Wilson's card on SCS. I love doing the tone-on-tone metallic embossing on same colour cardstock like what I did with the gold -- it's always so cool! I can't recall where the inspiration for the 4th card came from, but it uses 2 of the new "In Color"s for this year: Wild Wasabi & Purely Pomegrates with the "Baroque Motifs" set, some white shimmer paper and cute little half-back pearls from the "Pretties" kit. I also used the new "Basic Gray ink for the sentiment -- it's less harsh then using black and is so deep & rich! If you'd ever like more info about becoming a demonstrator yourself, please don't hesitate to ask. As far as I'm concerned, I think I have just about the best job in the world and I'd love to share more about it with you. It's time for us to have some FUN!!! Later on today, I'll be sending my July customer e-newsletter out and I'll be having a great SCAVENGER HUNT CONTEST for my Canadian subscribers. If you're not already on my list, don't delay - sign up (on the left) and start receiving my stamping newsletter filled with tips, specials and more! "Retired Rubber" Sale - come and see! They're here (well, most of them)! 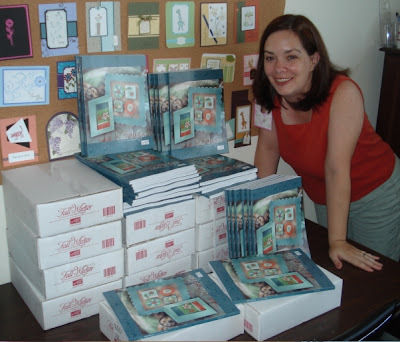 I have just received 16 of the 19 cases of catalogues that were ordered -- phew! For those of you who are having your catalogues mailed out, I'll be getting them in the mail (so be on the look out). I've updated my list of classes and events for the summer and you can find them online HERE. I'm still accepting Stamper's Club members for the August start date (club runs 10 months), so please contact me if you have any questions or want to join our band of merry stampers! Introducing the "Fall-Winter Collection 2007"
Click HERE to see the Canadian version of Stampin' Up! 's Fall-Winter Collection 2007 and then let me know what you think. Remember, this new catalogue will be valid until the end of December so you have a 6 good months to grab whatever you like! 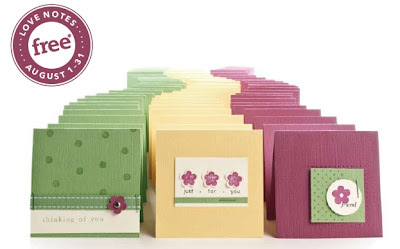 - new greetings sets, 2 of my favourites are "Wonderful Favorites" and "Define Your Life"
I counted up the amount of free stamp sets I'll be receiving at our annual Convention in Denver later this month...and it's ELEVEN -- yippee! - TONS of new ribbons: taffeta, wide grosgrain, Stitched Ribbons and 6 more fabulous "Ribbon Originals" series. Oh, and I could just go ON and ON and ON... but you'd be sick of me by then, and I know you want to look at everything properly yourself. If you're in Canada & would like more info about my new Early Bird specials, etc... please sign up to receive my e-Newsletter (link on left) or visit the SPECIALS page of my Stampin' Up! Business Website. I'm currently offering FREE SHIPPING & HANDLING on all orders over $75, anywhere in Canada. Please email me for more info! I've also updated the ART GALLERY page with current samples to inspire you with, plus I now have all my summer classes & events listed on my EVENTS page. Hopefully you'll find something to interest you and if not, let me know what kind of classes YOU are interested in!